If our most famous historical Republican’s claim that a nation divided against itself cannot stand, we should take heed of Thanksgiving more today than ever. Food brings us together, and hallelujah for it. Let us praise and honor the food that brings us together on this day. I have been writing and thinking about the meaning of cooking food and sharing it with people you love for 20 years now. Its fundamental importance to our health and happiness only grows more profound in my mind. The daily ritual of cooking and eating arguably gave our species the advantage it needed to triumph over the other upright and four-legged competitors to become the most successful species on the planet. If we can all, in our valuable differences, come together around food, perhaps we might retain that most elevated spot. Thanksgiving rules! Rule #1 (and perhaps the only important one, especially for the stressed cook): it all works out in the end! Worry a little if you wish, but in the end, the food is just an excuse to bring us together—sometimes it’s delicious, sometimes it’s not. Sometimes the turkey rare (cut it and recook it). Sometimes the oven breaks down (start the grill!). But you can’t keep thanksgiving from coming! #2: Make Stock: Stock you make at home is so far superior to broth it’s worth the effort. 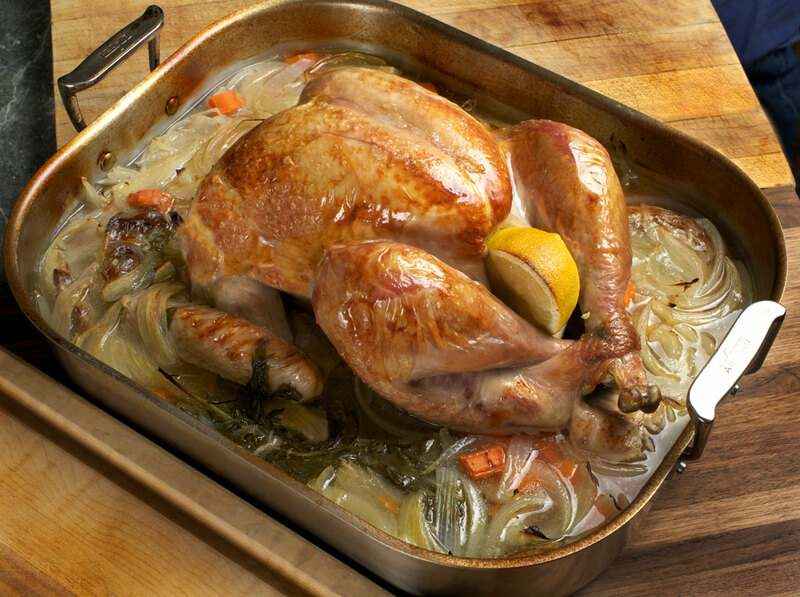 #4: Ensure the meat stays hot by serving it in a platter with hot turkey stock. This keeps the meat, especially the white meat, not only hot, but also moist. #5: I always serve, in addition to our native bird, a corn dish and a cranberry dish, to of America’s most unique crops and symbols. This year, it is my wife’s cranberry sauce, not my beloved fathers (his excellent recipe below), but she has in his honor baked his favorite dessert: pecan pie. And last,#6: Remember Rule #1: The food all comes out in the end for better or worse, so don’t stress. I hope that it has served its most important function: bringing us together. The Original Roasted/Braised Turkey Post with Illustrative Photos and Slide Show. If you want a traditional roast, here’s how: Roast Turkey, from my book How To Roast. Dressing, cranberry sauce, and homemade gravy; three must haves on your holiday table. Photos by Donna Turner Ruhlman. May your holiday be bountiful and peaceful and filled with love and great food! My turkey posts Spatchcocked Turkey, Roasted & Braised Turkey and Roasted Vegetables and Potato Gratin. My other holiday recipes Butternut Squash Soup, aged eggnog, and easy turkey stock. © 2017 Michael Ruhlman. Photo © 2017 Donna Turner-Ruhlman. All rights reserved. I’ve made your braised version for the last few years, always moist & delicious. one precooked smoked turkey leg from Whole Foods $1.41, one small sweet potato – microwaved from comments in previous post (thx! ), an awesome martini with pate, crab leg, avacado &champagne. good strategy. hope your thanksgiving was splendid. I made your beloved father’s cranberry sauce. We love it. Thanks for sharing it with us. Thanks. I miss my dad still. That’s good Michael – you probably always will. By the way, it’s been a pleasure to see you restart your personal life. Though we don’t celebrate thanksgiving but seriously so wonderful tips are given.